Ernst Haeckel’s famous (and now debunked) embryology image. Heading into my sophomore year at the University of Michigan, I needed one more “honors” class to qualify for an additional check mark on my degree but the classes I wanted didn’t fit into my schedule. I had already taken “Great Books” and “Great Books II,” and another other class I was considering had mandatory discussions on Friday mornings, an instant disqualifier. This thirteen-syllable-three-word formulation, my professor explained, was based on the work of biologist Ernst Haeckel and would be the foundational idea of our course. 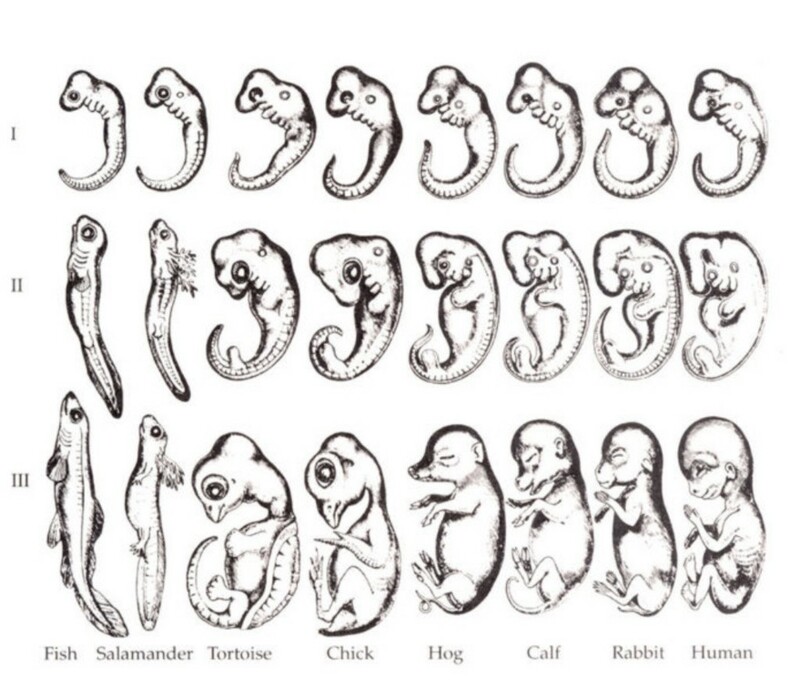 You may have heard of Haeckel’s famous illustration of animal embryos that start their development looking similar before the more evolutionary advanced species continue through additional stages (see above). The concept behind the drawing is that process of the individual creation (“ontogeny”) mirrors (“recapitulates,” or recaps) the process of the creation of the species (“phylogeny”). I never did realize what this had to do with imagination, but I did find a way to translate the phrase into Minnesotan-friendly English: Patterns found in the large can also often be found in the small. This implies that, for instance, we expect the learning of the individual child to follow the method by which all of humanity learned about the world. Some years later, I’ve now forgotten most of what I learned in college. I can’t tell you all that much about Human Evolutionary Anatomy, my Spanish is rusty, and although I do remember my microeconomics, it always takes me a hot second to remember on which axes P and Q sit. But against all odds, Haeckel’s recapitulation theory has stuck with me. It’s a powerful idea, and I’ve recently realized that it applies well to my current work in the blockchain world. In 2017, a number of scam Initial Coin Offerings appeared out of nowhere. Most began with little more than a whitepaper and a dot-io domain name; even the team was optional, as some founders preferred not to exist at all. Many rapidly captured the public’s imagination with grandiose claims of an idyllic, decentralized future, then weaponized that attention to accumulate massive amounts of capital via ICO (a strategy that the SEC just declared to be in violation of securities law). The treasure troves of cash those teams acquired — normally in the tens of millions of dollars — put the pressure on those projects to deliver what they had promised, but most failed. Teams were either too hesitant to put that much capital at risk, got mired in the political debates that surround such financially consequential decisions, or simply ran off with their fraudulently acquired riches. In any case, whether due to fraud, hacks, scams, or simple incompetence, these great booms generally ended in near-total collapse. The thought that struck me — and that I hope struck you as you read the above description — is how well the launch of an individual ICO mirrors that of the broader journey of blockchain technology’s first ten years. In both cases, the general arc bends from lofty promises to high expectations to crushing collapse. Following the ICO boom of 2017 — and all the sketchy behavior that surrounded it — there was a massive bust as the blockchain bubble popped. More than $700 billion of total market capitalization for cryptocurrencies was destroyed over the course of a long, hard year for traders, and, for many, those dreams of a decentralized, idyllic future died along with it. The hope, of course, is that blockchain can recapture the imagination of the public — that phylogeny can diverge from ontogeny, and the rut in which blockchain finds itself today is just an obstacle on the path to glory, not a site for eventual burial. We’ve recently seen glimpses of “crypto spring” on the horizon, but fully recovering from this first public failure will not be easy. As entrepreneurs try to leverage blockchain technology to create products that people need, they will face another challenge: the aftertaste of distrust that lingers among the general public. More on blockchain and trust coming soon! I’m working on a book called “Trust(less),” to be released later this year. Follow me on Twitter (@cdkeil) to stay in touch. Phylogeny, Ontogeny, and Blockchain was originally published in Hacker Noon on Medium, where people are continuing the conversation by highlighting and responding to this story.